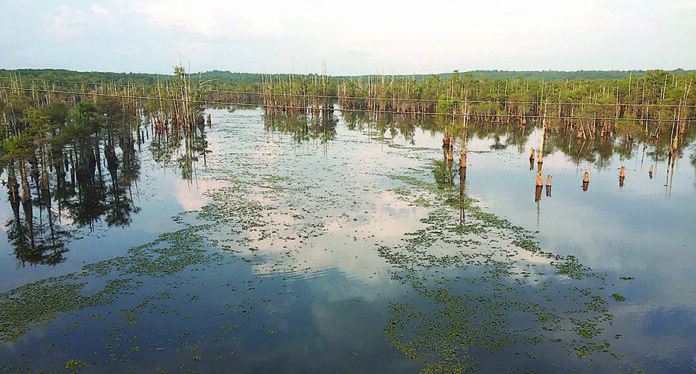 The Louisiana Department of Wildlife and Fisheries has scheduled a drawdown of Black-Clear Lake in Natchitoches Parish for giant salvinia control, reduction of organic material and fish habitat improvement. The drawdown is designed to reduce the further expansion of salvinia as summertime temperatures promote maximum growth. The water control structure is scheduled to open Aug. 6 and the lake should dewater at a rate of 3 – 6 inches per day. The water level will be lowered to a maximum drawdown level of approximately 4 feet below normal pool stage to a target level of 95 mean sea level. The Black-Clear Lake control gates are scheduled for closure Jan. 29, 2019, to allow the lake to refill for early spring recreational activities. During the drawdown, an estimated 7,000 – 8,000 acres of water will remain in open areas of Black-Clear Lake. Boaters may still access the lake from either the Black Lake Lodge or Chandler’s Camp ramps, located on the north side of the Hwy 9 Bridge. Caution is also advised when on the water, as numerous obstructions that are normally not seen are present. This action is a necessary component of LDWF’s integrated management plan to control overabundant aquatic vegetation growth and to improve access for recreational activities. An annual cycle of high and low water fluctuation can provide beneficial effects similar to a natural overflow lake system. The current LDWF Black-Clear Lake Aquatic Vegetative Management Plan can be viewed at: http://www.wlf.louisiana.gov/fishing/waterbody-management-plans-inland.